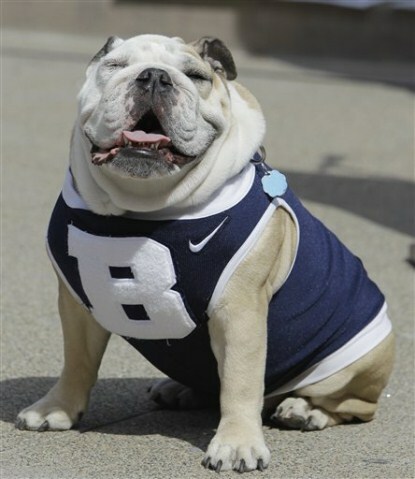 The famous Butler Bulldog mascot named Blue 2 is traveling to the Final Four in style. Blue 2 is the 7-year old dog and will not only be staying at a 4-star hotel, but also has his own seat on a chartered plane. This is better treatment then most people traveling to watch the game will experience. Michael Kaltenmark, the bulldog’s handler, is traveling with him to Houston this Friday. The 63-pound bulldog is accompanying the rest of the Butler fans on a special chartered Southwest flight. This is his second trip to the Final Four. The extravagant hotel he is staying at is Houston’s 4-star Intercontinental hotel. Once in Houston, she will receive his own security detail. Before leaving, he will be going to a dog spa and getting his hair washed and dried, then finished off with his nails done and a little sprits of doggie cologne. Talk about the high life.